The MA in Global Political Economy and Finance is a 30-credit program that provides students with a sophisticated understanding of the world economy in historical context, the political economic analysis of the dynamics of contemporary world capitalist society, and state-of-the-art tools of political economic and financial analysis. 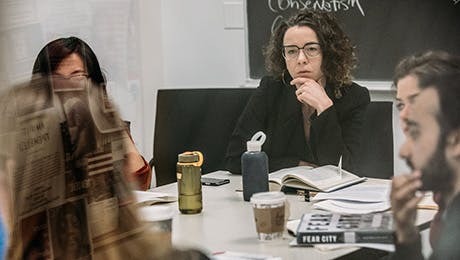 In addition to offering a rigorous course of study in economic and statistical analysis, the MA in Global Political Economy and Finance provides a thorough grounding in historical and contemporary political economy and finance, culminating in an internship or mentored research project. A flexible elective option allows for concentrations in classical political economy, international and development economics, financial economics, environmental economics, or the economics of labor markets and race, class, and gender. The program offers the training required to pursue advanced degrees in economics, finance, business, and related fields, and provides students with the analytical and policy skills required for careers in finance, government, business, and international development. This program will be STEM-designated as of May 28, 2019. After graduating, eligible F-1 students in this program can apply for an additional 24 months of Optional Practical Training at the end of their Post-Completion OPT. A full account of degree requirements and procedures is contained in the Economics departmental handbook. To earn the MA in Global Political Economy and Finance, a student must complete a total of 30 credits with a minimum grade point average of 3.0. There is no written comprehensive examination; the MA degree is awarded for successful completion of the required 30 credits. A maximum of three credits taken at another university may be granted toward the credit requirement for the master's degree. At least 27 credits must be completed at The New School for Social Research. The three electives can be any courses offered by the Department of Economics or courses offered by other departments that approved by the Economics faculty advisor.